ESA410K Air Conditioner Haier's Energy Star® Qualified 10,000 BTU Electronic Control Air Conditioner is great for cooling a mid-size bedroom or office. Enjoy quiet operation, convenient time/temperature digital display, and 24 hour on/off timer. The magnetic remote control attaches right to the unit, and installation is easy with the Quick-Snap window curtain. This unit features 3 fan speeds and 3 cool settings, dehumidify function, and energy saver mode. Keep cool while saving energy and money! ENERGY STAR® Qualified room air conditioners use 10% less energy than standard models which could mean consumers can save more than $60 over the lifetime of the unit. MagnaClik Remote Conveniently store your magnetic remote on the side of the air conditioner unit for easy access. Quick-Snap Window Kit A unique design detail that ensures easy and accurate installation. 24-Hour Timer Convenient timer function is a true energy saving feature that allows you to easily set the air conditioner to turn on or off at preferred times. 2-Way Air Direction The front air discharge lets you adjust the direction of the air flow to the room, allowing you to control where you want your comfort. Energy Saver Mode This mode allows you to cool your room while saving energy. 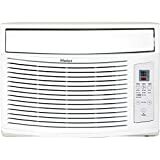 Haier ESA410K 10,000 BTU 115V Window-Mounted Air Conditioner and MagnaClik Remote with Braille out of 5 based on ratings.